You know how sometimes, when an issue of a comic book has been delayed for a long time, it finally shows up and it’s absolutely worth the wait? The last few issues of Fray and Midnight Nation come to mind. Unfortunately, Final Crisis #6 does not fit into that category. The first few issues were structured like a mystery, presenting various fragments that slowly piece themselves together into a coherent picture. But now that the whole picture has been put together, we’re still only seeing fragments. It’s kind of like watching Cloverfield, except the reason we’re only seeing bits and pieces isn’t because we’re following a single viewpoint, but because we’re following too many. The weird thing is, as unsatisfying as it is to read (though it does improve the second time through), I’m half-convinced that the fragmentation is intentional. It fits with the disintegrating cover design, and it fits with the theory that theme is more important than plot in this book. And, in fact, it fits with Grant Morrison’s comments about paring a comic down to the bare essentials like dance music. Of course, not everyone likes dance music. This is the first time in the series that I’ll complain that something doesn’t make sense. For the most part, everything critical has either been shown within the pages of the book or presented as a mystery that will be explained later. But you know what? I don’t see the connection between the Superman scene at the beginning and the Superman scene at the end. There’s no through-line. And Lois? The last we saw she was at death’s door. What happened? Yes, it’s been a month, and we can infer that she’s received some sort of miracle treatment while the rest of the world has gone to hell, but it’s still jarring. Flash:: We have some hints as to how Barry returned from the dead. I liked the idea of sending the kids to search the armory. If we actually get to see Barry and Wally against the Black Racer, that will be (and I rarely use this term these days, but it was the first thing that came to mind) awesome, but I was hoping to see all three Flashes in action together. It’s interesting to see it suggested in canon that the Black Flash (the manifestation of death as it comes for speedsters, or of the deadly aspect of the speed force) and the Black Racer (the New God responsible for bringing death to the other New Gods) are one and the same. Now I wonder just how much input Grant Morrison had on the original Black Flash concept. As I recall, the plan was that he and Mark Millar were going to collaborate on twelve full issues of The Flash before Waid and Augustyn came back, but the last three issues — “The Black Flash” — were credited only to Millar. I wonder if it’s something the two of them were bandying about during their run on the book, but didn’t get to until Morrison left, or whether it’s something Millar came up with on his own. There were a lot of scenes with couples or almost-couples, weren’t there? Barry and Iris. Green Arrow and Black Canary. Liberty Belle and Hourman. Hawkman and Hawkgirl. And the couples who were kept apart: Jay and Joan, Wally and Linda. Mary Marvel: Good that she’s back to normal. I just hope that they can restore her powered form to normal during the post-Final Crisis fallout. Batman: I see a strong irony in him having to use a gun at the end of his life. 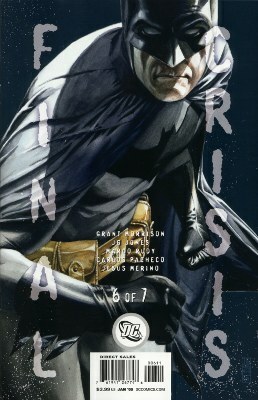 I don’t really have anything to say about how it meshes with “Batman: RIP” because, well, I haven’t been reading it. As for him being dead permanently: In a world where Flash, Superman, Wonder Woman, Green Arrow, and Green Lantern have all died and come back to life, I have no doubt Bruce Wayne will be back eventually. This entry was posted in Reviews and tagged Black Flash, Final Crisis, Grant Morrison on January 14, 2009 by Kelson. Excellent point about the pacing. Theme more than plot; subtext more than text; the beat more than the melody. Really, it’s surprising to me how many people do claim to be enjoying this, given how deliberately unconventional the narrative style is. I DO enjoy this title, and pacing is definitely not a problem. What kind of transition would you expect where so much is happening?! I love this event/mini. Its been a great read, and I can’t wait to read the last issue. @Shashank: I’d forgotten that. I guess I’m also getting the Omega Sanction and Omega Effect mixed up. Those eye beams can do all kinds of things, can’t they? I love dance music and I’m loving this series so far. I just wish we got to see more of The Flashes. But that’s what I always say when I read these massive crossover thingies. I’ll have plenty of Flash in a few months and I can’t wait until the conclusion of this. Though the inconsistent scheduling and art anomalies have been frustrating, overall, I’ve enjoyed FC. But it’s not for everyone (esp. stupid people), and DC did a lousy job of managing expectations and the scheduling made matters much worse. In the end, however, we’ll have the collected editions. No one complains these days that Watchmen #12 was late, do they? I’ve really enjoyed the various FC annotations, especially those by Wolk and Uzumeri, as I’m not terribly plugged in to all the DCU continuity and Kirby minutiae. But I enjoy Morrison and how his mind works, and it’s been a lot of frivolous fanboy fun in these often grim times. Remember DC UNIVERSE #0: 3 page previews of the main characters? It just feels the whole series was like that: a few pages here and there about a theme, but with too many pages with obscure characters, and compressed actions with no captions. I like the series, but just “like”, it’s not something as good as it should be, for me of course. I would love to see more of The Flashes too but it’s all we got by now. @Kelson: I think if it was 12 issues then Morrison would just stuff more things in; this comic is supposed to frenetic and chaotic, with little time to breathe after the slower, more ominous first couple of issues. I find the overall effect exciting, but I can see why some might not like it. The next page is Batman vs. Darkseid. Batman shoots Darkseid just before the Omega sanction – a purplish-white beam that is just about to hit Batman With a smile, Batman (or so we think) says, “Gotcha” with a smile. We assume he meant – I gotcha, and then he dies. But notice what actually hits Batman – two bright yellow beams of light. Did Barry and Wally just pull Batman into the speed force? Was it Barry or Wally that said, “Gotcha.” Is Batman’s absence going to be similar to Wally’s disappearance and return from the speed force? Was Barry brought back to save Batman? I know, I know, the body at the end. But we all saw Booster’s body – maybe it’s the black racer. I’m not saying this is what happened, but just a few thoughts I had on second reading. Interesting, and I think it could be really awesome. That’s an interesting idea! One question: FBB?